My husband is of Spanish descent. Because of these roots, I routinely find myself in another world when researching names in his family tree, as naming conventions for the typical Latin/Hispanic name are quite different from English-speaking naming patterns. For those unfamiliar with these conventions, researching and finding ancestors may be challenging but can be overcome. Double-Surname System: Hispanics use a double-surname system, a pattern dating back to the 16th century. The first name is the paternal surname (apellido paterno), which is the father’s first surname, and the second is the maternal surname (apellido materno), which is the mother’s first surname. As an example, take a man named Benigno Antonio Cordero y Rosa. He would be the son of a man named Cordero and a woman with the surname Rosa. As you can see, what traditional Anglophone cultures call the mother’s maiden name is being passed down a further generation. Rosa is not considered his last name but part of his complete last name. We’ll discuss that letter “y” found between the surnames later. As well, other additions to the name can be used, including possible middle names and married names (which are added at the end). 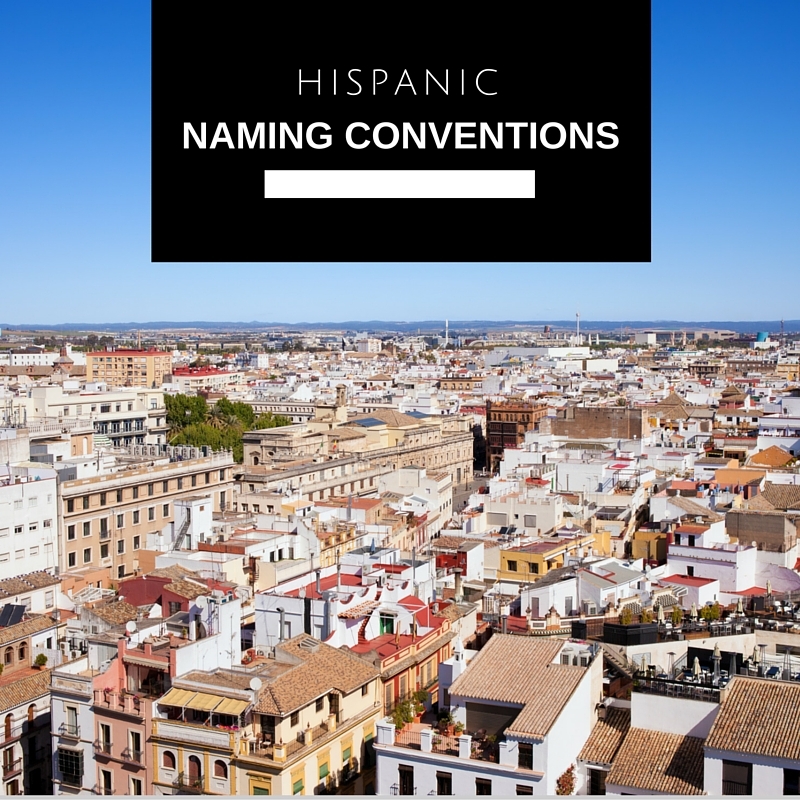 All this means that Spanish names can be quite long and use a lot of words. Most persons will have a name with four to even up to eight or nine words/names in it but their familiar name—the one used daily—will be shorter. Official registries, the Registro Civil, will record a child’s identity as made of a given or forename (single or composite) and two surnames but note that, often, a child is baptized religiously with several, even many, forenames. This longer version doesn’t carry legal significance and it is not unusual for a name to possess eight or nine words in it. Children that are not recognized by their father may be registered with only a first surname that is the mother’s surname or they may use the mother’s surname as first surname and second surname. Commonly Used First Names: In my husband’s family tree, there are several men named “Maria.” Huh? Under the traditional Hispanic naming traditions, the name “Maria” was given to most children, even males, to maximize their divine protection! The name Maria was considered a perfect name for either a male or a female child in honor of the Virgin Mary. The first of the two given names of the child tells the reader the gender of the person. For a male, the name would be preceded by a masculine name such as Jose, e.g. José María Lopez (Joseph Mary Lopez). He would never be called María. Likewise, a girl can be formally named María José (Mary Joseph), and informally called a nickname. She would never be called José. In records, the name María as a masculine name is often abbreviated in writing as M. (José M. Alers), Ma. (José Ma. Alers), or M.ª (José M.ª Alers). The name José is commonly abbreviated as Jo. The particle “de” (English: “of”): Upon marrying, but depending on the country, women today often keep their own family names out of respect towards her family, as it is considered impolite towards her family to change her name. If she chose to take her husband’s last name, she would most likely have added his first last name, or the name of his father, to her first last name. When Maria Antonia Cordero Canales marries Genaro Reyes Miranda she would be addressed as either Maria Antonia Cordero de Reyes or as Maria Antonia Cordero Canales de Reyes. This traditional pattern is dying out, however. Use of the Particle “y” (English: “and”): Depending on the country, family names were historically linked by the conjunction y or e between the last names. In the 16th century, Spaniards adopted the copulative conjunction y to distinguish a person’s two surnames. The conjunction y avoids denominational confusion when the paternal surname might appear to be a first name. This tradition has mostly died out and doesn’t seem to be used much anymore. Wonderful! I’m passing on the link to this blog post to everyone I know. I’m married to a Spaniard, and this is a terrific reference. And I’M a Wilkinson! Though my line started as McQuilkin’s in Scotland and became Wilkinson when they headed over to Cape Fear, North Carolina in the early to mid-1770s. Thanks for the kind comments. I enjoy your blog as well! Are you heading to Rootstech in Feb? Thanks. This helps me since I teach in a city with many hispanic students. It was quite a while after I married my Hispanic husband before I realized why he didn’t have a middle name and why he had TWO last names. I am Spanish and Mexican and this is the best explanation I have read. My parents carried on this tradition. Thank you for the kind words. It’s appreciated. Not complicated at all, no hyphen, no changes. All this to say, it is possible. It’s a different way of thinking, but it exists in many many countries, and I really like how it preserves identity. Thank you for the post, it was perfectly explained. Thank you for stopping by and for the comments!